Coach Derek Stingley projects Yang as a linebacker as he has good size and is physical. He should be able to step in as both Fan Rong and Tian Ye were released at the end of the season. Norman has the physical tools according to coach Stingley. At 6-1, 200 Norman currently plays for the Cleveland Gladiators in the AFL. The Coastal Carolina product from Greenwood, SC, has played professionally since with stops in the IFL, NFL training camps, the Canadian Football League and the AFL. He is the brother of Josh Norman who currently plays with the Washington Redskins. Coach Stingley calls McNeil a “wide body” which is a good description of the 6-2, 325, seven year pro who now plays with the Tampa Bay Storm in the AFL. The Riverside, CA native played his college ball at Fort Valley State and also has AFL experience playing for the San Jose SaberCats. This player was actually found by Skywalkers receiver Shuai Liu for coach Stingley who gave him an evaluation and labeled him with “good hands.” With the departure of Yu Jeong Jong, Zhang would have a place on the roster. Li is a run blocker and according to the coach brings size to the offensive front. 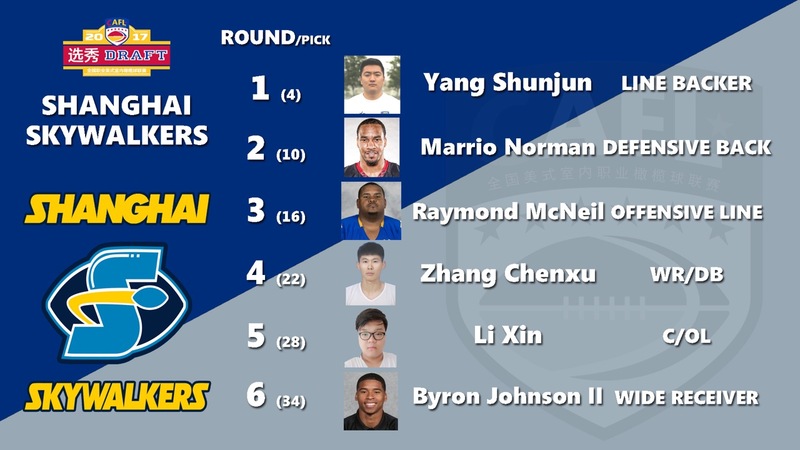 He will also have the responsibility of providing protection for quarter Shane Austin who was the CAFL Offensive MVP last season as he threw for a league best 35 touchdowns and 1,436 yards. Johnson, who is two years removed from playing college ball, is a physical receiver who likes contact. He may also see time in the defensive backfield.